ENGEL will be demonstrating how maximum output, consistent quality and permanent availability can be combined with excellent efficiency levels through perfect cooperation between an injection moulding machine, a mould, automa-tion, application technology and support at the Saudi Plastics and Petrochem exhibition taking place from 17th to 20th February 2014 in Riyadh, Saudi Arabia. Thin-walled containers: The all-electric ENGEL e-motion injection moulding machine turns thin-walled containers that meet high-tech requirements into low-cost products. ENGEL packaging turnkey solutions help processing companies to conserve energy and raw materials, and to integrate various process steps by incorporating techniques such as in-mould labelling. ENGEL works with system partners who are also leaders in their respective fields here, and some of these partners will be exhibiting in cooperation with ENGEL in Riyadh. Those joining ENGEL at the trade fair include Swiss IML expert BECK automation and Otto Hofstetter, which is also Swiss and a leading producer of moulds for thin-wall applications. Pallets: ENGEL helps plastics processing companies to follow the trend of switching to plastic pallets early with flexible system concepts based on its large yet compact ENGEL duo machine. In doing so, ENGEL creates systems from a wide technology spectrum, in order to reduce pallet weight and optimise part handling. The system partners ENGEL works with in this area will also be at the Saudi PPPP in Riyadh, which means even very sophisticated turnkey solutions will be able to be worked out during the exhibition. Fittings: When large moulds with lots of core pulls and sliders are used, as the produc-tion of fittings requires, for example, the tie-bar-less ENGEL victory machine keeps both the investment and the operating costs low. In addition, the barrier-free clamping unit fa-cilitates automation and enables moulds to be changed more quickly. 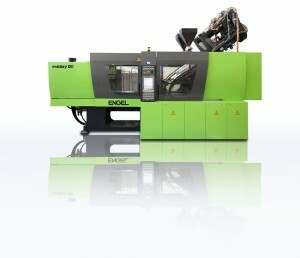 Irrespective of whether it’s the increasingly popular PPR that’s being used or PVC and CPVC, which are difficult to process, ENGEL will adapt the plasticising unit to the individual require-ments of the materials being processed, and therefore enhance the efficiency of the whole system as well. When selling a system to a customer, ENGEL supplies the injection moulding machine, the automation, the mould project engineering, the process technologies and its services from a single source, which enables efficiency potential to be exploited in the best possible manner. The Austrian-based machine builder’s dense network of subsidiaries, offices and service locations ensures that it is always close to its customers – regardless of where they are in the world. At the same time, ENGEL’s cost- and time-efficient support is aided by intelligent Internet-based software solutions.